Most of the time, people do not remember their dreams from the night before, but what if you didn’t have to remember them in order to relive them? Mathias Svalina provides a service for this exact desire of the imagination. Google Mathias Svalina, the man behind the Dream Delivery Service, he’s like a shyer Mac DeMarco, but instead of creating music, he creates dreams. The New Writing Series program welcomed Mathias Svalina last week in the Geisel Library Seuss Room. Svalina is an American poet and founder of the Dream Delivery Service. In addition to being the author of five published works, he’s also been recognized and awarded by major organizations including BBC, NPR, The Pushcart Prize, and the New Michigan Press. If that isn’t impressive enough, get this: he’s the co-founder and editor of Octopus Books press. The Dream Delivery Service is a subscription service that includes daily personalized “dreams,” which Svalina hand-writes and delivers himself within a four-mile radius of his home. For those who live outside of that area, he mails the dreams inside of a bright pink envelope, which he ensures reaches the homes of his customers before morning. Svalina travels town to town, hand-delivering little pieces of his imagination for people to enjoy. Some of these people he knows personally, others he knows only by their names and addresses, but each of these special customers receives a personalized, unique dream. When introducing Svalina, UC San Diego Professor Brandon Som described his work as “surreal and serial.” Svalina’s reputation proceeds him, for his work is indeed surreal, but the talent this man holds isn’t obvious at first glance. When he first emerged, Svalina sheepishly walked up to the podium, wearing an unassuming outfit. He was wearing a dark blue baseball cap with a small, bright-colored bird in the front center, paired with a dark blue plaid button-down, and dark-wash jeans. On the ledge of the podium stood two figurines, an owl and a camel. Naturally, one would assume that these figurines would come into play at some point during the reading, but they were only addressed when Svalina said “I brought my owl and my camel” while gesturing toward the two guests on the podium, and that was that. 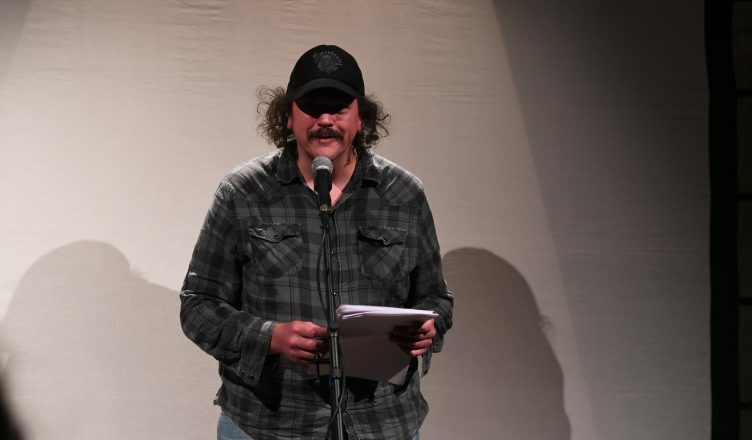 During the event, Svalina read aloud excerpts from his book “Wastoid,” as well as some of his favorite dreams he’s written for customers in the past. One of the dreams that stood out in particular, was one about a man who falls in love with a bomb. The man grows jealous at the sight of the bomb strapped onto another man’s chest. In anger, he impulsively detonates the bomb in order to get rid of the competition but loses it in the process. As a result, the man spends the rest of his life grieving over his lost love while collecting pieces of shrapnel and watching footage of the explosion on repeat. From the man in love with a bomb to a man made only of blood, all of Svalina’s characters are undoubtedly one-of-a-kind. Most of the stories he read were surreal, dream-like experiences in which something is happening to “you” or “you” are observing something happening to a fictional character. Svalina’s poems effectively recreate the impalpable, dream-like haze where nothing really makes sense, inciting our futile attempts to try and find meaning in even the most absurd scenarios when there isn’t always an inherent moral or purpose. After the reading, the audience was given the opportunity to ask Svalina questions about his work. However, when asked about the meaning of the dreams he creates, he responded sincerely that he did not know. He lets his stories stand on their own; he does not try to psychoanalyze what he creates. Instead, he chooses to bask in the pleasure of writing for the sake of writing. Oftentimes, we fall victim to the misconception that stories need to have a lesson to be considered “good,” but that’s not necessarily true. Each thing Svalina writes, each story, dream, or scenario that he creates provides an outlet for his imagination to run wild. What results from this unabashed, uncensored imaginatory indulgence is something quite beautiful, and it doesn’t need to make sense for one to enjoy it all the same. Courtesy of The Denver Post.